Widespread die-offs expected in Alpena, Dickinson, Keweenaw, Mackinac and Ontonagon counties. Today, the Michigan Department of Natural Resources announced that it has received the first reports this winter of bats dying from white-nose syndrome. 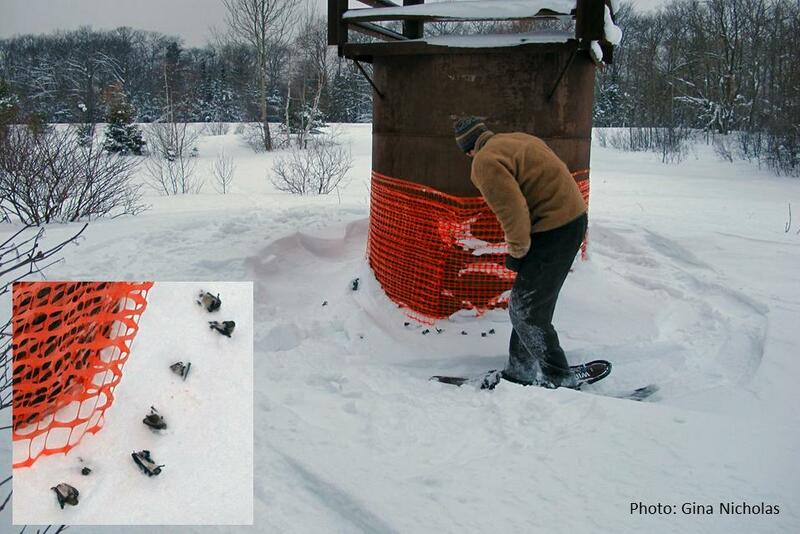 Members of the public found dead bats outside the opening of an abandoned copper mine near Mohawk in Keweenaw County and reported it to DNR field staff. White-nose syndrome was first discovered in Michigan in late winter 2014 in Alpena, Dickinson, Keweenaw, Mackinac and Ontonagon counties. Widespread die-offs of hibernating bats are expected in all of these counties, and potentially others, this winter. Experience with white-nose syndrome in northeastern states suggests that most dead bats will be found within 100 yards of the openings to the mines, caves or other places in which they hibernate (called ‘hibernacula’), but some bats may travel a mile or more before dying. Because most of the major bat hibernacula in these counties are in relatively remote areas, most people will probably not see the bat die-offs. 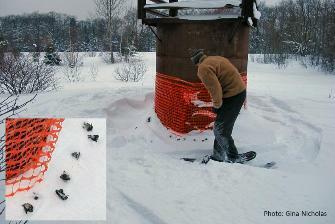 However, in towns like Iron Mountain, Hancock and Norway, where large numbers of bats hibernate in mines within the city limits, area residents may see dead and dying bats. These bats may be on the ground, or roost on trees, buildings or other structures close to humans and domestic animals. While there is no connection between white-nose syndrome and rabies, bats can carry rabies, a virus that infects the central nervous system of mammals, including people, and causes death if not properly treated. Rabies is most commonly spread by the bite (or contact with the saliva) of an infected animal. Bats are the animals most commonly found infected with rabies in Michigan, although the disease is relatively rare even in bats. The DNR asks that bat die-offs this winter be reported on the DNR website or by calling 517-336-5030. 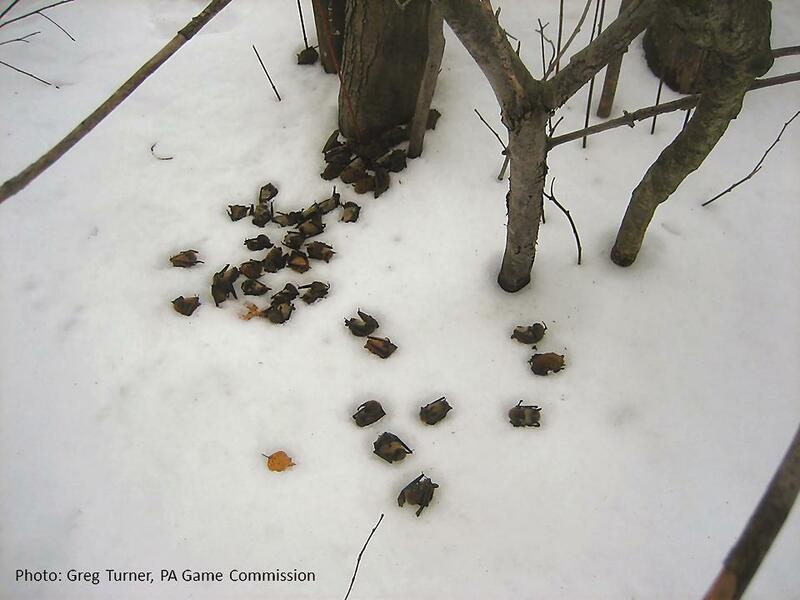 The DNR will not be collecting and disposing of bat carcasses where die-offs have occurred. The public can safely dispose of dead bats by picking them up with a shovel or heavy gloves and placing them in plastic trash bags for routine garbage disposal. Rehabilitation of bats is prohibited in Michigan because of the potential for exposure of humans and domestic animals to rabies. Long-term, the public can best help bat populations recover from the effects of white-nose syndrome by staying out of mines and caves where bats hibernate (unless proper biosecurity precautions are taken), becoming educated about the critical ecological roles bats play, and supporting bat research and conservation. For more information on bats and white-nose syndrome, visit www.michigan.gov/wns and www.whitenosesyndrome.org. WNS_dead bats_Keweenaw: Dead bats with white-nose syndrome (inset) at a mine opening in Keweenaw County. Photo courtesy of Gina Nicholas.